Dragonsfire's 'Visions Of Fire' is the first full-length release from these German metal mavens. 'Visions Of Fire' is an album you're going to either entirely love or completely dismiss. You may love it because it falls into that beloved category of 'true metal' offering glimpses of classic heavy metal, thrash metal, and power metal. Additionally, you might love because it bleeds those great heavy metal themes of demons, dragons, war, and battle. Other reasons to favor Visions Of Fire' are Torsten Thassilo Herbert's Lemmy meets Gene Simmons gravel voice and those flaming guitar solos from Bludau and Rauscher. Unfortunately, these points may be the very same reasons to dismiss 'Visions Of Fire.' Though Dragonsfire has the whole 'true metal' sound nailed down, with a few exceptions, the songs are predictable and unimaginative. Real promise is found on only two tracks 'The Defendant' and 'Shine On' with a possible honorable mention for highly melodic 'Oath Of Allegiance.' These are only significant thanks to some more clever bass work and vocal arrangements. Additionally, Dragonsfire burdens us with metal mediocrity with, first, self promotion (not unlike American rap artists) on the corny 'Dragonsfire Rockxxx,' and second, with Manowar-like metal promotion on the agonizing 'Burning For Metal.' Another cause for dismissal may be those guitar solos which are often too short and almost always smothered by the production mix. In the end, I found myself more than a little ambivalent over Dragonsfire's 'Visions Of Fire.' For true metal, the torch is held high but, even with their excellent talent and courageous determination, Dragonsfire is setting a small fire that will not be seen. 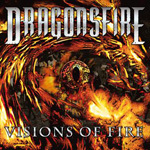 I found myself more than a little ambivalent over Dragonsfire's 'Visions Of Fire.' For true metal, the torch is held high but, even with their excellent talent and courageous determination, Dragonsfire is setting a small fire that will not be seen.